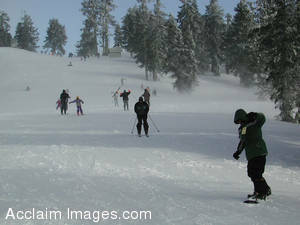 Description: Stock Photo of Snowboarders and Skiers on the Mount Ashland. This picture shows the family sport of sking. Some are sking, some are snowboarding, but it's a sport they can all do together. You may license this image as stock photography or purchase it as a poster or an art print.